Few young players have made quite as big an impression on LaLiga in such difficult circumstances as Juan Camilo ‘Cucho’ Hernandez this season at Huesca. Cucho made his LaLiga Santander debut just last August aged just 19, in what was also his club Huesca’s first-ever appearance in Spain’s top flight. The teenager played a key role in Huesca winning at Eibar on opening day, and then in picking a creditable draw at Athletic Club in their second game before sensationally putting his team 1-0 ahead at Barcelona’s Camp Nou on Matchday 3. 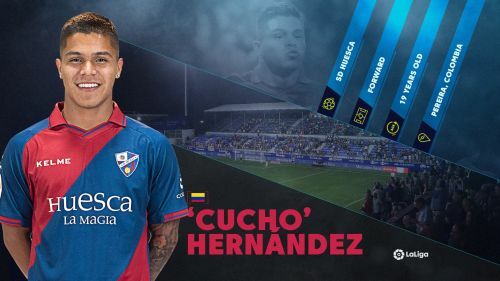 Huesca were soon brought down to earth by a heavy defeat at Barcelona and the realities facing a club in their first-ever season in LaLiga Santander, but Cucho has continued to perform admirably, with his technical qualities and work rate standing out. Another well-taken goal saw Huesca pick up a much-needed point at home to fellow strugglers Villarreal in December, while he also scored later that month away at Champions League candidates Valencia. Late March brought another landmark goal at one of LaLiga Santander’s biggest stadiums, as Cucho stunned Real Madrid's at the Santiago Bernabeu by putting Huesca 1-0 up with a composed finish from 10 yards out. Again, his team were unable to hang on for the win – eventually being beaten 3-2 thanks to a late Karim Benzema goal – but the youngster had shown how comfortable he was on the biggest of stages. Spanish statisticians soon pointed out that the last teenager to score for an opposition team at both the Camp Nou and Bernabeu in the same season was then Atletico de Madrid forward Sergio ‘Kun’ Aguero, now a global superstar. Nobody else has achieved the feat for more than half a century… except Cucho Hernandez. Breaking records and exceeding expectations has always been the norm for Cucho, who was born in the Colombian city of Pereira on 20th April 1999. He made his senior debut for Deportivo Pereira in Colombia’s second tier aged just 15 and within just 12 months had scored a first professional hat-trick for his hometown club. Such performances drew attention from current LaLiga 1l2l3 team Granada CF, but instead Hernandez was signed by English side Watford in summer 2017. The opportunity to join Huesca on loan came 12 months later, with Cucho immediately settling at the Aragonese club and scoring his first goal in just his second LaLiga 1l2l3 game at Lorca. 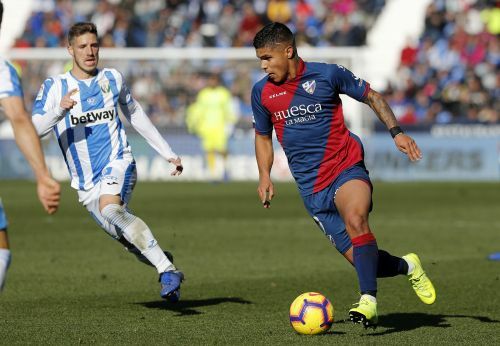 A prolific season followed, and his total of 16 goals and eight assists was crucial as Huesca surprised even themselves by gaining a first-ever promotion to LaLiga Santander last season. Cucho’s progress has unsurprisingly brought international recognition. Aged just 17 he scored twice for Colombia at the 2017 South American U-20 championships. Given his trajectory it was no surprise when he scored twice on his full national team debut against Costa Rica last October. Such rapid progress puts Cucho among the brightest rising stars in world football. Some more crucial goals to help Huesca achieve survival in their debut LaLiga Santander season would be no surprise. And from there anything seems possible.